It's not Agrium's fertilizer production PotashCorp is necessarily interested in, but rather its vast network of retail stores. Regulators may be willing to consider the concerns U.S. farmers have about being channeled into purchasing almost all of their crop nutrients from a single retailer. Image source: Getty Images. While it's true that the merger of equals being considered between PotashCorp (NYSE:POT) and Agrium (NYSE:AGU) won't run into many regulatory hurdles in Canada, that's not to say that everyone will be supportive of the two crop nutrition giants joining together. In particular, U.S. farmers would likely be outspoken critics of the deal. PotashCorp and Agrium say they're discussing a merger, but nothing concrete is on the table. A deal might not happen. But if it did, Reuters reports that analysts at National Bank estimate the result would be a massive crop nutrient producer that controlled 62% of potash capacity, 30% of phosphate, and 29% of nitrogen. Pick up a bag of fertilizer and you'll see the letters N-P-K on the packaging, referring to the percentages of nitrogen, phosphorus, and potassium it contains. These crop nutrients are essential for plant growth whether in a backyard garden or on biggest commercial agricultural operations, and the trio of PotashCorp, Agrium, and Mosaic (NYSE:MOS) are the leading producers in North America. They also jointly own Canpotex, the potash marketing and distribution association that negotiates with foreign purchasers. It's because the three companies already work in concert in selling potash that many industry observers suspect a merger between PotashCorp and Agrium would have little impact on pricing, as their output would continue to go through Canpotex. And because both companies are Canadian, the deal wouldn't run afoul of the country's Investment Canada Act, which ultimately prevented Australia-based BHP Billiton (NYSE:BHP) from acquiring PotashCorp in 2010. Potash -- and much of the rest of the fertilizer market -- is suffering from a period of depressed pricing that was brought on by the collapse of the commodities bull market, and then deeply exacerbated by the 2013 breakup of the other big international potash cartel, between the Russian and Belorussian producers. As the two vied for market share, supply outpaced demand, causing prices for the crop nutrient to plunge. Belorussian producer Belaruskali, which had been half of that cartel, recently signed contracts with India and China for potash at prices 30% below those from 2015, which were already discounted from the price when the cartel disbanded. The depressed market has caused producers to try to take capacity offline to balance supply with demand and bolster prices. BHP Billiton, for instance, may not move forward with its massive Jansen mine in Saskatchewan if the pricing environment doesn't improve, and Mosaic recently laid off 330 workers after suspending production at its Colonsay mine. PotashCorp has also temporarily closed some mines. Yet it's not so much Agrium's crop nutrient production PotashCorp is interested in: Agrium is also the largest farm retailer in North America, with $5.8 billion in reported retail sales in the second quarter. That's a 6% drop year over year, but the decline mostly stemmed from the lower prices crop nutrients were getting. Segment gross profits, on the other hand, were up 1.2% year over year, at near-record levels. Agrium's retail operations comprise more than 1,400 outlets, 63 terminals, seven plants, and 17 distribution centers in North America, South America, and Australia. They generated $12 billion in revenues last year -- more than three times the sales it generated from its global wholesale business, which produces, markets, and distributes all major crop nutrients for agricultural and industrial customers. It just announced it was acquiring two more retail operations that would add 34 more stores in the U.S. and Canada. PotashCorp doesn't have a retail network like that, and gaining access to Agrium's would help it weather the volatility of the commodities market better. 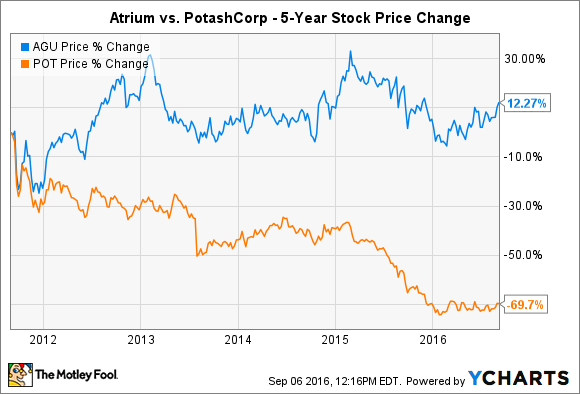 Over the past five years, Agrium's stock has returned some 12%, while PotashCorp shares have experienced a 70% decline. U.S. farmers, though, are already under pressure from their own low-pricing environment for their crops. Corn today goes for a little more than $3 per bushel, nearly half of what it was getting just a few years ago, while wheat has fallen by a like percentage. They're also being cornered by consolidation underway in the seed and chemicals markets: Syngenta is being acquired by China National Chemical; Dow Chemical and DuPont are looking to merge; and GMO seed giant Monsanto (NYSE:MON) is being pursued by Bayer. The Justice Department is also trying to thwart John Deere's (NYSE:DE) plan to acquire Monsanto's precision planting technology business for being anticompetitive, too, so a situation in which there were fewer companies from which to buy fertilizer and crop protection products doubtless wouldn't sit well with them. Canadian farmers probably wouldn't be ecstatic either. The deal may still get a pass from regulators because there are low-cost international suppliers, but the idea of Canadian and U.S. farmers being forced to shop for those vital supplies in Eastern Europe may not sit well. It could end up being the tractor lobby that causes this merger of equals to fall apart.